Join Aladdin as he tries to make his fortune whilst dreaming about marrying the gorgeous Princess Jasmine… but watch out… the evil Abanazar is lurking in the shadows to try and ruin everything! 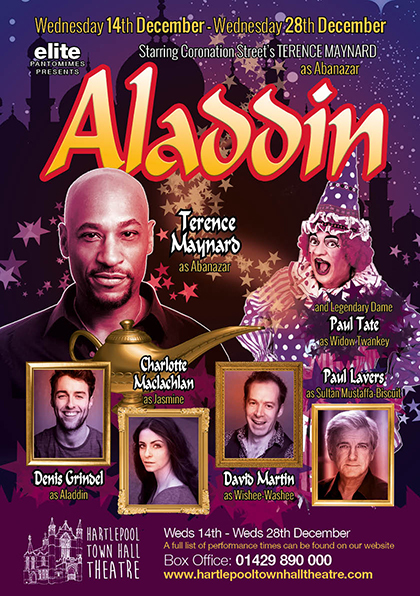 This brand new production of Aladdin features all the fun and laughs of a traditional, family pantomime, backed by a live band, so sit back and join us for this magical adventure. With a flying carpet, a mysterious genie and a good old-fashioned song-sheet you are sure to have fun. If you are granted three wishes this year, make sure of of them is to join us for Aladdin!